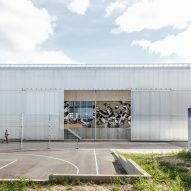 A translucent polycarbonate skin wraps Streetmekka Viborg Build, a former windmill factory that Danish studio EFFEKT has transformed into a hub for street sports and youth culture. 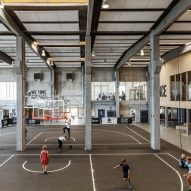 Located in the Danish city of Viborg, the 3,170-square-metre building offers a wide variety of facilities for self-organised sports, as well as social spaces for local youth. 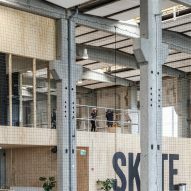 These include a huge skating bowl, basketball courts, maker workshops and DJ facilities. 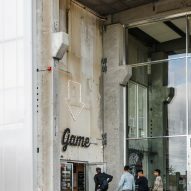 "We have taken the most generic building of them all – the industrial manufacturing warehouse – and transformed it into a vibrant cultural hub for street sports and culture targeting the youth not fitting into or not drawn by traditional organised sports organisations, " explained Mikkel Bøgh, chief operating officer of EFFEKT. 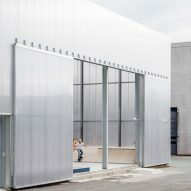 The former prefabricated concrete and corrugated steel windmill factory occupies a 2,000-square-metre site. 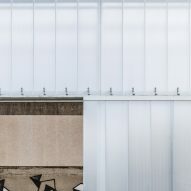 The outside of the building is newly wrapped in a translucent polycarbonate skin, intended to make it appear light and welcoming, and also differentiate it from its industrial neighbours. In addition, this skin will serve as a giant canvas for local artists to display and project their art. 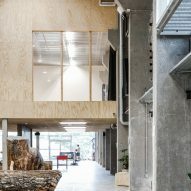 Large sliding doors open the cathedral-scale central factory space to the outdoors. Beyond them, the space is laid out to like a streetscape. 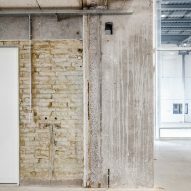 The centre's various functions are arranged in relation to their specific requirements, such as spatial quality, daylight, materiality and temperature zones. 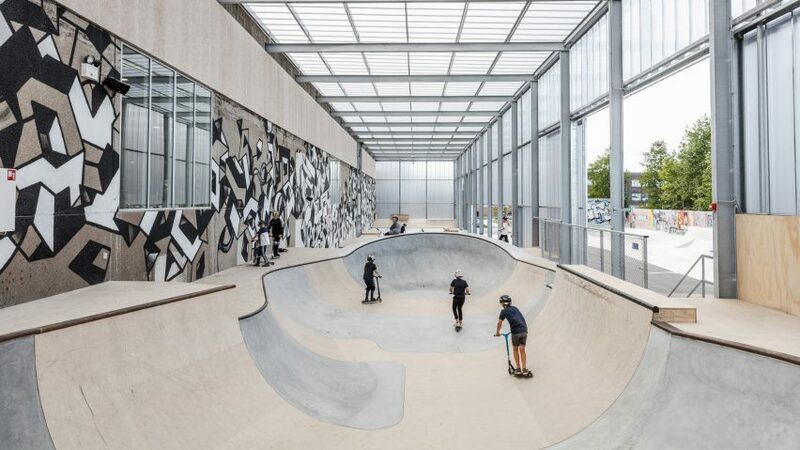 "Our approach was simply to remove the walls at both ends of the building and to place all the administrative functions and workshop spaces on one side of the existing structure and the skate-areas on the other side, leaving the internal former manufacturing space intact," said Tue Foged, partner at EFFEKT. 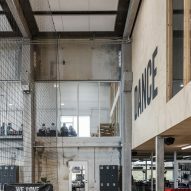 The centre offers a wide variety of facilities for self-organised sports like parkour, skate, bouldering and basketball. 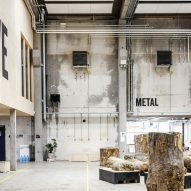 But there are also customised workshop areas for music production and DJ'ing, an animation studio, a fabrication lab and various artist studios, and wood and metal workshops. Social spaces and informal meeting areas are distributed throughout the building, strategically interwoven between the various facilities. This layout was based on the notion that proximity to activities lowers the threshold for participation. 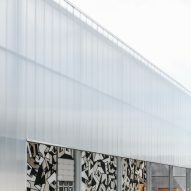 The architects said that the surrounding landscape will become the natural extension of the centre's indoor spaces, with various street-sports and cultural functions placed along a recreational string of greenery that connects the site to Viborg's downtown area through a future pedestrian and bicycle path. 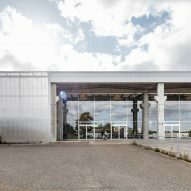 Before the renovation, the building resembled a mass-produced warehouse or factory typical of the late 1960s and 70s. 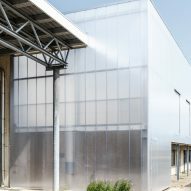 These types of abandoned industrial buildings, made from prefabricated concrete panels and corrugated steel, are often perceived as having little value. But EFFEKT hopes this project shows how these structures can be reused and reprogrammed in a qualitative way and for a limited budget. 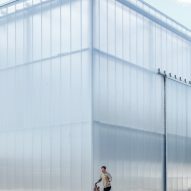 "However uninteresting and grey the exterior of these boxes appear, they often contain an impressive interior space of magnificent scale and almost cathedral-like proportions based on a repetitive, neatly arranged structural system," said Foged. 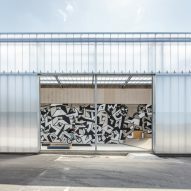 "To us this vast space posed the only true value of the building – and we wanted to expose and highlight this to the outside world." 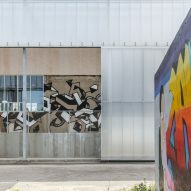 The architects believe that this approach to regenerating abandoned industrial buildings may be replicated elsewhere and can pave the way for the revitalisation of other buildings that have been left to deteriorate or are facing demolition. 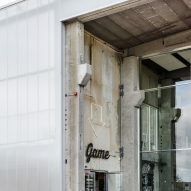 They suggest that Streetmekka Viborg Build will continue to evolve with its users – both in the short term, due to the animated facades and the street-art, and the long term, when new programmes are added and old ones are removed. 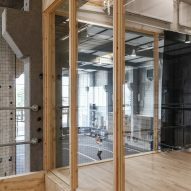 "Targeting a broad demographic audience from across a variety of cultural backgrounds, gender, age and interests, our goal was to create an open and welcoming building, lowering the threshold for involvement and engagement," added Foged. "We achieved this by making a transparent building with a clear, well-defined organisation intuitive to everyone. 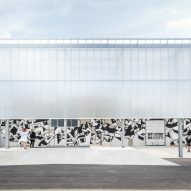 An anti-elitist, pop-culture take on a hybrid between a sports facility and a culture house, that is robust enough to stay open to the public 24 hours day without supervision and where the users are in charge and take initiative." 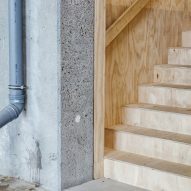 Mikkel Bøgh said the preservation of the original structure and the reuse and upcycling of materials made it possible to carry out the refurbishment at a very low expense. "It is an extremely economical conversion at €500 per square metre, but incredible value. Since the opening they have had almost 1,000 new members each month," he said. 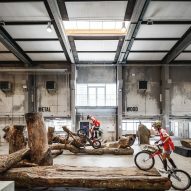 Many of the building's original components have been repurposed as furniture elements for the parkour activities and hang-out spaces. 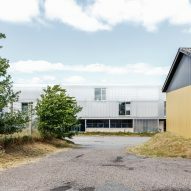 The architects said that the final cost of the building is approximately one third of a traditional sports hall. The studio's other projects include a low-cost home designed to be flexible for a growing family and a cancer care centre made up of seven house-shaped buildings. Photography is by Rasmus Hjortshøj. Client: Viborg Kommune and GAME with financial support from Realdania, Lokale- & Anlægsfonden, TrygFonden and NordeaFonden.